MANILA, Philippines – On this day in history, a very important policy change – one that is associated with a papal visit – took place. It was the Martial Law era in the Philippines when Pope John Paul II visited the country in February 1981 – his first. The announcement came at a time when an increasing number of human rights abuses by the military were being reported. And “to minimize papal criticism of his regime” Marcos lifted martial law on January 17, 1981 – almost a month before the papal visit – via Proclamation 2045. In the long text provided in the Proclamation (read the text here), Marcos also listed down a number of reforms his government had reportedly achieved – describing it as a “Democratic Revolution”. Among them were reforms in education, security, agriculture, and the economy. “The Filipino people, having subdued threats to the stability of government, public order and security, are aware that the time has come to consolidate the gains attained by the nation under a state of martial law by assuming their normal political roles and shaping the national destiny within the framework of civil government and popular democracy,” Marcos said in the proclamation. Apart from the papal visit, the lifting of Martial Law was also reported to be timed to the election of Ronald Reagan as US president. But Martial Law, despite its “abolition”, did not escape mention in the pope’s remarks when he arrived in the country. The challenge that faces each nation, and more particularly a Christian nation, is a challenge to its own internal life. I am sure that the leaders and the people of the Philippines fully realize their responsibility to construct an exemplary society and that they are willing to work together to achieve this end in a spirit of mutual respect and civic responsibility. It is the joint effort of all the citizens that builds a truly sovereign nation, where not only the legitimate material interests of the citizens are promoted and protected, but also their spiritual aspirations and their culture. Even in exceptional situations that may at times arise, one can never justify any violation of the fundamental dignity of the human person or of the basic rights that safeguard this dignity. Legitimate concern for the security of a nation, as demanded by the common good, could lead to the temptation of subjugating to the State the human being and his or her dignity and rights. Any apparent conflict between the exigencies of security and of the citizens’ basic rights must be resolved according to the fundamental principle – upheld always by the Church – that social organization exists only fοr the service of man and for the protection of his dignity, and that it cannot claim to serve the common good when human rights are not safeguarded. People will have faith in the safeguarding of their security and the promotion of their well-being only to the extent that they feel truly involved, and supported in their very humanity. It is my hope and prayer that all the Filipino people and their leaders will never cease to honor their commitment to a development that is fully human and that overcomes situations and structures of inequality, injustice and poverty in the name of the sacredness of humanity. I pray that everyone will work together with generosity and courage, without hatred, class struggle or fratricidal strife, resist­ing all temptations to materialistic or violent ideologies. The moral resources of the Philippines are dynamic, and they are strong enough to withstand the pressures that are exercised from the outside to force this nation to adopt models of development that are alien to its culture and sensitivities. Recent initiatives that are worthy of praise augur well for the future, since they manifest confidence in the capacity of the people to assume their rightful share of responsibility in building a society that strives for peace and justice and protects all human rights. 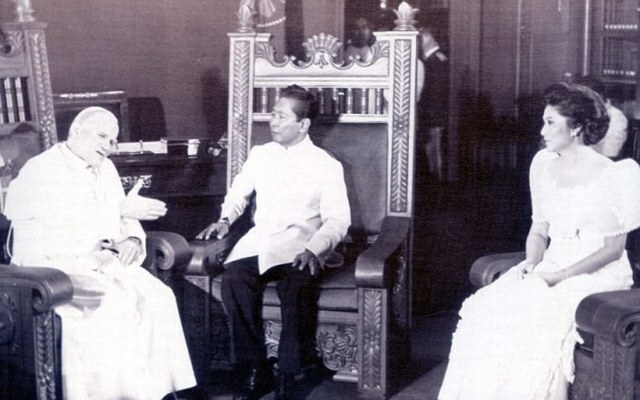 The Pope also reportedly refused to accept the Marcoses’ invitation for him to stay at the Coconut Palace – originally built to serve as a guest house for him – due to its ostentation.